Here is another pretty Ozotic that was sent to me for review. 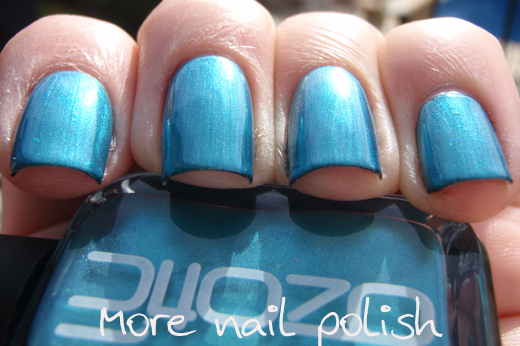 This is Ozotic 743 from the duochrome range. 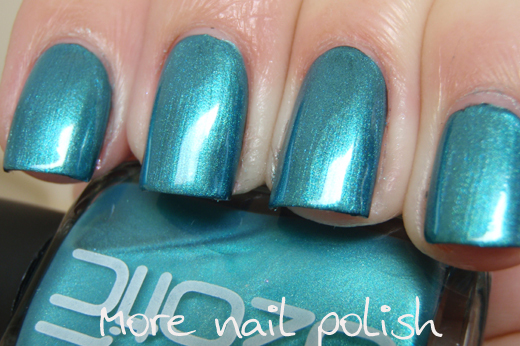 I absolutely love this colour, but I have to say I did really struggle to see the duochrome effect with this polish. All the other Ozotic duochromes that I have tried have a very strong and obvious colour shift, but this one is very subtle *read as nearly non existent*. Here is Ozotic 743 on its own, two coats. Nice opacity at two coats. Next I tried it over black to see if it would bring out the duochrome colour shift any stronger. Unfortunately it only made a teeny tiny difference. The below photo was the closest I got to capturing the colour shift in this polish. 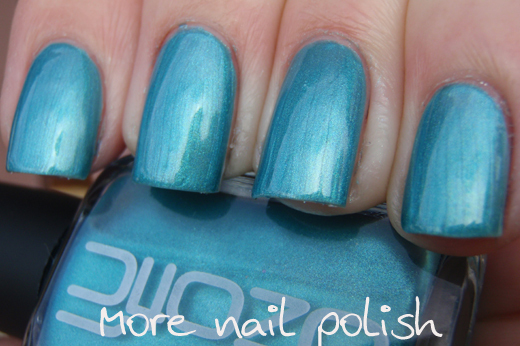 The aqua shimmer of the polish remains, but the base colour seems to shift a little darker blue. I seriously could not find any swatches of this polish online. One or two bottle shots, but that was about it. If you own this polish and have photos of it swatched, I'd love to see them. Feel free to spam my comments with your links to photos. I love the earlier one better, but this one is also a gorgeous shade!! It is true, does not have anything of duochrome, a nice blue and anything any more. Well, simply more expensive.